The delinquency rate for mortgage loans on one-to-four-unit residential properties decreased to a seasonally adjusted rate of 6.96 percent of all loans outstanding at the end of the second quarter of 2013, the lowest level since mid-2008. The delinquency rate dropped 29 basis points from the previous quarter, and 62 basis points from one year ago, according to the Mortgage Bankers Association’s (MBA) National Delinquency Survey. The delinquency rate includes loans that are at least one payment past due but does not include loans in the process of foreclosure. 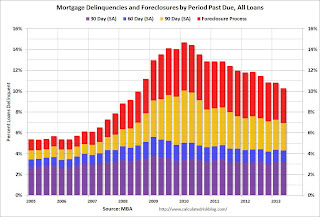 The percentage of loans on which foreclosure actions were started during the second quarter decreased to 0.64 percent from 0.70 percent, a decrease of six basis points and reached the lowest level since the first quarter of 2007 and less than half of the all-time high of 1.42 percent reached in September 2009. The percentage of loans in the foreclosure process at the end of the second quarter was 3.33 percent down 22 basis points from the first quarter and 94 basis points lower than one year ago.